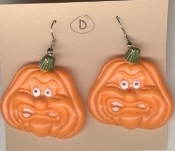 HUGE Funky Creepy ANGRY PUMPKIN JACK o LANTERN EARRINGS Scary Grouchy Face Guy - Spooky Halloween Haunted House Novelty Charm Costume Jewelry - Style #D. Dimensional Front, Flat Hollow Back Plastic Classic Orange Color Charms, each approx. 1.5-inch (3.75cm) diameter. He's really MAD!! !